$195. 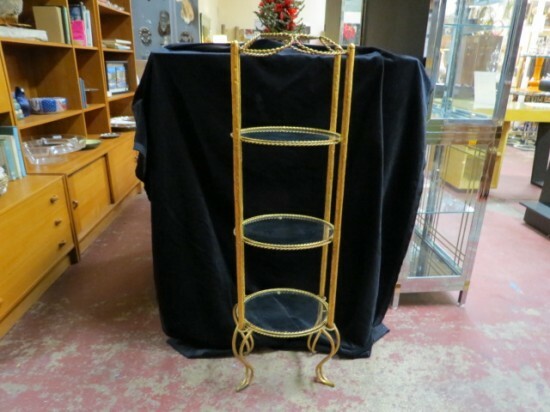 Vintage antique French style 3 tier glass and gilt metal shelf unit, c. 1940. Really nice, tall shelf unit. 3 oval glass shelves surrounded by gilt metal rope design. Decorative gilt metal rope design on top. 4 round gilt metal poles attach to the shelves. 4 curved gilt metal legs. Perfect in your bathroom, bedroom or living room to hold perfume, soaps or decorative objects. Very good condition. 12in wide, 7in deep, 44in tall.